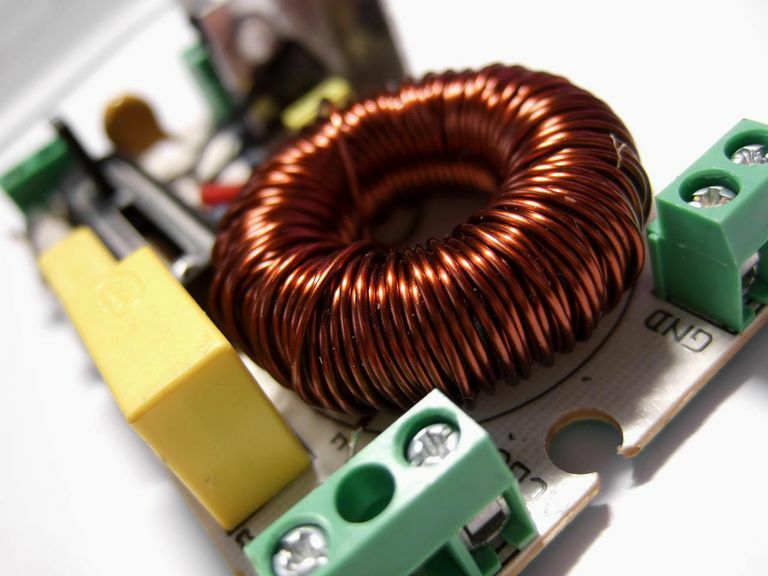 Inductors have a wide variety and important applications in electronics. Inductors are available for high power applications, noise suppression, radio frequency, signals, and isolation. To meet the needs of these diverse applications several types of inductors have been developed and are in a variety of form factors from small surface mount inductors to chassis mount. Coupled inductors are types of inductors that share a magnetic path and influence each other. Coupled inductors are often used as transformers to step up or step down voltage, provide isolated feedback, and in applications where mutual inductance is required. Multilayer inductors get their name from the layers of coiled wire that are wound around a central core. Adding additional layers of coiled wire to an inductor increases the inductance but also increases the capacitance between the wires. These inductors trade off higher inductance for a lower maximum operating frequency. Inductors that are molded into a plastic or ceramic housing are known as molded inductors. Generally, these inductors have a cylindrical or bar form factor and can be found with several types of winding options. Power inductors are available in a wide variety of form factors and power levels from surface mounts inductors that can handle a few amps to through-hole and chassis mount power inductors that can handle tens to hundreds of amps. With the amount of current that power inductors are often subjected to, large magnetic fields are created. To prevent these magnetic fields from inducing noise in other parts of the circuit, it is recommended that magnetically shielded inductors be used if possible. High-frequency types of inductors, also called radio frequency of RF inductors, are designed to operate at high frequencies. These inductors often have a higher resistance and lower current rating. Most RF inductors have an air core rather than use a ferrite or other inductance boosting core material due to the increase in losses when those core materials are used which would reduce the operating frequency of the inductor. Due to the operating frequency of the inductor, several sources of loss become important including the skin effect, proximity effect, and parasitic capacitance. The skin and proximity effects effectively increase the resistance of an inductor. Several techniques are used to help reduce these losses including honeycomb coils and spider web coils to reduce parasitic capacitance and litz wire is often used to reduce the skin effect. A choke is an inductor that is designed to block high-frequency pulses while letting lower frequency pulse through. Their names come from the choking off or blocking of high-frequency signals. There are two classes of chokes, power chokes, and RF chokes. Power and audio frequency chokes typically have an iron core to increase their inductance and make them more effective filters. RF chokes use iron powder or ferrite beads combined with complex winding patterns to reduce parasitic capacitance and operate effectively at high frequencies. Higher frequency chokes will use non-magnetic or air cores. The push for smaller and more mobile devices has led to the explosion in options for surface mount types of inductors. Surface mount inductors are often used in DC-DC converters, EMI filtering, energy storage, and other applications. Their small size and footprint make surface mount inductors an essential element in the mobile and portable electronic designer's component toolbox. Surface mount inductors are available with and without magnetic shielding, with current capabilities in excess of 10 amps, and with very low losses. Often surface mount inductors will use an iron or ferrite core or special winding techniques to optimize the performance of the inductor and maintain a small footprint and form factor. Air cores have higher frequency operation due to no core losses but a lower inductance. Toroidal cores are cores shaped like donuts that reduce radiated EMI and provide high inductance. Laminated cores have high inductance with lower hysteresis and eddy current losses.